We’ve got an exciting announcement for you! 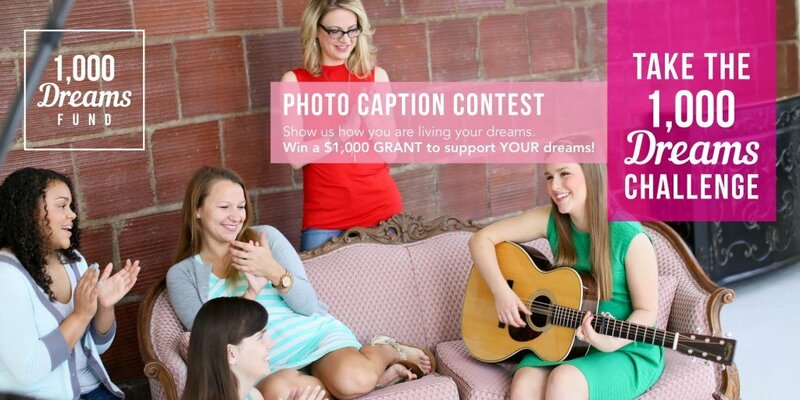 Today marks the launch our first-ever 1,000 Dreams Challenge, a four-week photo caption campaign on social media with one $1,000 grand prize and two $500 prizes at stake. SWEET! The 1,000 Dreams Challenge is intended to help you fund those out-of-classroom opportunities (study abroad, internships, conferences, etc.) or educational expenses (graduate school exam fees, tech devices and books) that will help you reach your ultimate professional dream. The 1,000 Dreams Challenge invites our fans and followers to submit a photo (on Facebook, Twitter or Instagram) using the hashtag #1000DreamsChallenge with a caption that best describes what they are doing to reach their career or professional dream. The five top-voted photos will become finalists at the close of the campaign on Monday, November 23rd. The finalists will move forward to the final stage in which the 1,000 Dreams Fund team will pick the three winners. Winners will be announced on Tuesday, November 24th. One grand prize winner to receive a $1,000 grant along with two runners-up who will receive $500 each. The grants are intended to help winners fund their career goals and dreams. Since its launch, the 1,000 Dreams Fund has awarded 20 students with up to $1,000 in funding to support out-of-classroom opportunities and educational expenses critical to success in the real world. Learn more about the 1000dreamsfund.org. Head on over to 1,000 Dreams Fund to learn how to get funding for your dreams!